Our review of the BT Vision TV service. 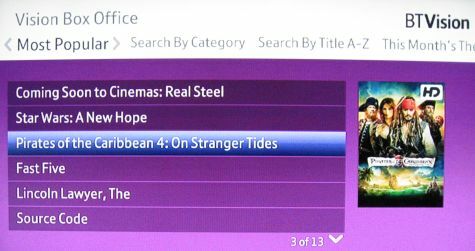 We look at BT’s home digital TV service, which combines Freeview with a library of on-demand movies and TV shows. We also answer common questions on the service, as well as provide help and advice. Can I get BT Vision? The BT Vision service includes the BT Vision V+ box, which stores up to 80 hours of TV and lets you access thousands of hours of online TV and films. What does BT Vision offer? Over 40 TV channels and 20 radio channels (See BT Vision channels). Watch a selection of TV shows from the last seven days, from the BBC, ITV, Channel 4 and Channel 5 – sometimes referred to as “catch-up TV“. A 14 day electronic programme guide, as well as an on-screen guide to allow selection of on-demand content. You can also search for TV shows and films by name or actor. On-demand content includes hundreds of films, TV shows, music videos, sports from Sky Sports and ESPN and kids shows. BT Vision is available across the UK. If you want get BT Vision, you need to get your broadband from BT. Cost: There are two packages, BT Vision Essentials for £4 a month, or BT Vision Unlimited for £12.50 a month. See btvision.bt.com. On this page, we take a look at the BT Vision set-top box, the service, and what’s on offer with the BT Vision On Demand content. You can also listen to our audio review in Show 53 of FrequencyCast, our podcast. The BT Home Hub has to be physically connected to both a phone line (for Broadband) and the BT Vision+ box. If your Home Hub isn’t near the TV and a phone line, you can make use of special HomePlugs to send data over your home’s mains wiring. The BT Vision set-top box is connected to the TV via a SCART lead or HDMI lead, and to the BT Home Hub via a standard Ethernet RJ45 cable. The Vision+ box is the heart of the system. It connects to the TV and to your Home Hub. It is a combined Freeview box and hard-disk recorder that connects to the Internet for on-demand programmes and films. It supports series link, live pause, and lets you watch one channel whilst you record a different channel. We have a special page dedicated to the BT Vision+ Box, so if you’re interested in delving more deeply into the box, its connectors and the technical specs, go to our BT Vision Set-top Box Specs page. There are three main buttons you’ll need to use on the remote: the ‘BT Vision’ button to get to the main menu and your recorded shows, the ‘TV Guide’ button to get to 14 days of programme listings that are available over the Internet, and the ‘On Demand’ button that opens the door to the online content available for watching via the BT servers. Accessing the On Demand content was very easy – and BT has gone out of its way to make browsing and searching for content as easy as possible. There are several ways of searching for everything – searching films by genre, TV shows by TV channel, A-Z listings, and a free-form text search. This search feature is our favourite – there’s one search engine for everything, on demand content, shows in the EPG, even actors and directors. A great way to find what you’re looking for and some thought has clearly gone into how to get to the wealth of content available. The BT Vision service is pretty smart. The BT Vision+ box is the heart of the system, and it has a built-in hard disk recorder which is used to record the various Freeview channels without the hassle of DVDs or video tape. 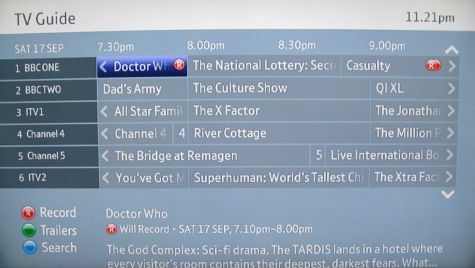 There’s also a Series Link option, so you can select a programme and get the BT Vision box to record each episode (in the right order) without having to keep track on when your favourite series is on. The Vision+ box has a pretty impressive 14 day on-screen programme guide with an excellent search feature that blows the Sky+ search out of the water. 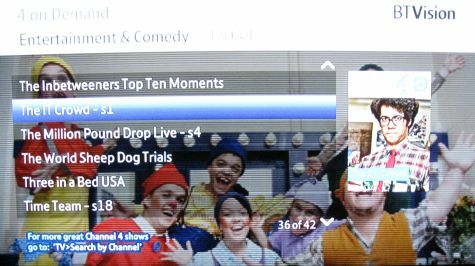 This lets you search for shows on Freeview as well as shows that are available on the On Demand service. You can also search by actor / director, so you’re not limited to just the programme name. Watching On Demand content is great too. Later on this page, we summarise some of the TV shows available to watch “on demand”. The selection in the first few months perhaps a little small, but we’ve seen the collection grow month-on-month. Our most-used service at the moment, is Catch-up TV – the ability to watch a TV show that’s been on in the last 7 days, and watch it at a time to suit you. Vision Replay currently offers on demand content from the BBC, ITV, Channel 4 and Channel 5. We’re pretty impressed with BT Vision – the service is easy to use, with the option to sign up to get all you can watch on subscription, or to choose pay-as-you-view, it’s flexible and good value for money. If you have a question, first check out our BT Vision FAQ, then if your question’s not answered, please ask in our forum and we’ll try to help. We also have a BT Vision forum and a dedicated BT Vision mailing list, so please feel free to sign up. Hundreds of films priced from £1.99 for a 24 hour rental. For more details and a list of sample films, see our BT Vision Content Review section. High Definition: A smallish number of HD films are available for download over Broadband with BT Vision. Live TV is supplied using Freeview. Extra ‘on-demand’ content is available for download. This isn’t like a traditional TV channel, there’s a huge store of TV shows from a range of channels and content providers that you watch via BT Vision over the ‘net. When we last counted, over 1,500 TV shows were available. You can access TV content by category, channel, ‘TV Replay’ and ‘Premium TV’ categories. Prices between £0.79 or £0.99 per episode, or for £6 a month for the TV Package. Catch up TV (last 7 days) content is available from the BBC, ITV, Channel 4 as well as Channel 5. There’s also content from the likes of Warner, Sony Entertainment, National Geographic, Discovery On Demand, HBO, ABC, Comedy Central, Adult Swim, CBS and MTV. Content from BBC Hits, Cartoon Network, Disney, Disney Playhouse, Baby TV and Nickelodeon. Last time we counted, around 850 kids shows. Prices for most items are 49p. Music videos, concerts and Music Extras. With BT Vision, you can watch live FA Premier League games, live Scottish Premier League games, as well as non-UK sports such as Live Italian Serie A, Live German Bundesliga, MMA, French Rugby, UFC, Major League Baseball, NHL Hockey, NCAA Basketball and more. A couple of dozen games including Pub Quiz, Hangman, Solitaire, Patience, Sudoku. Typically £0.50 for a 60 minute rental. Day passes are available. More on alternative Internet TV services on our dedicated Internet TV Advice page. I have a BT Vision box but have had to disconnect it because it interferes with ALL channels. The picture is pixilated for periods at a time. I have heard a loud clicking from the box attached to the mains supply and believe this to be the cause. At times the channels will be classed as unavailable and it tells me to check my connections. The root cause is the Vision box. Now that the Vision supply is disconnected the Reception is good.